I’ve been playing a lock recently, which is only a big deal because I don’t usually play alts. My primary motivation is to see the quests from the 1-60 Cataclysm content. After finishing Tirisfal Glades, I made it to Silverpine Forest. I felt excited just walking into the zone. Wasn’t Silverpine Forest really boring before the Shattering? It was exciting now, but the fact that I like Forsaken architecture and design probably helped. And the scene in which Garrosh arrives to talk to Sylvanas at the beginning? Excellent. The most interesting thing about the old Silverpine, if memory serves, were the elite Sons of Arugal (?) that wandered around doing their best mini-Fel Reaver impressions. The current Undead 1-25 (roughly) storyline is by far my favourite in the game, now or ever. Silverpine carries over into Hillsbrad and there are a few continuing storylines you’ll come across that are some of the best anywhere. 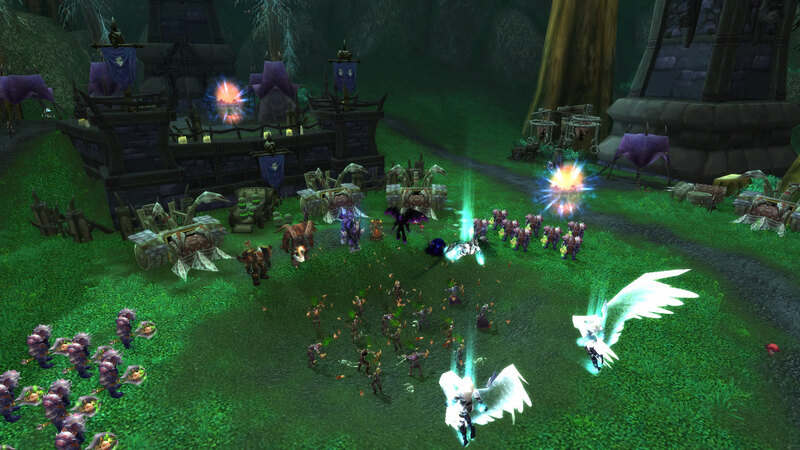 The Worgen starter zone questline also intersects and only the Undead side actually sees any continuation. Anyone who hasn’t done it should spend an afternoon sometime questing through those zones and finish them off, don’t stress quests going grey… they’re still more than worth doing. I never completed Loremaster of either continent pre-Shattering, but kind of just ran around doing a lot. Until I started playing this character, I hadn’t touched the old zones at all. It’s pretty nice having all this content to see. I’m enjoying the Forsaken stuff. And yeah, I actually did the Worgen starting experience first. Yeah, old Silverpine was definitely quite boring except for the level 25 elite Sons of Argual that wandered around. In a level 10-20 zone.